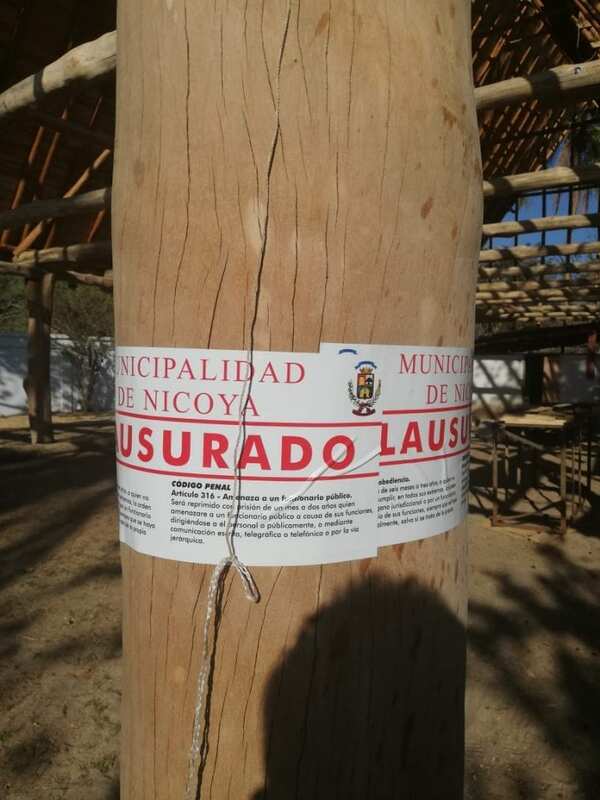 This is the third time City of Nicoya orders to stop construction on maritime zone. 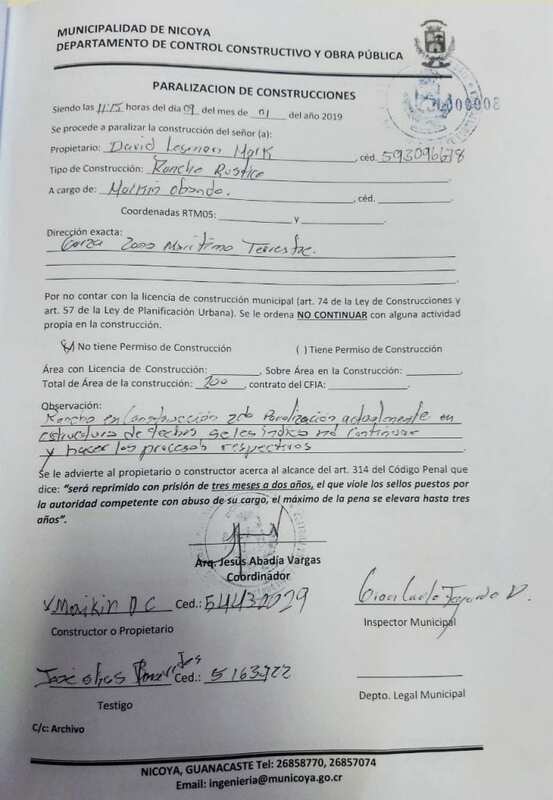 The City of Nicoya shut down construction of an illegal ranch in Playa Garza’s maritime zone three times on a parcel of land that U.S. citizen David Mark Lesman is trying to register as his. Every time the construction department went through Garza, Nosara, oficial engineers noticed that work had continued despite city orders to stop. The last time was Wednesday when engineer Josué Ruiz told workers that he would be back with police if he found them building again, according to the official. The Maritime Zone Law (ZMT) No.6043 states that no one can build on the 50 meters of public beach. The Voice of Guanacaste has a copy of the city files showing that part of Lesman’s ranch and fence are located in the public zone. The law requires the city to demolish any constriction in the ZMT that was built without proper permits, but the local government still hasn’t done so. The department in charge of the ZMT hasn’t issued a demolition order. Article 13. 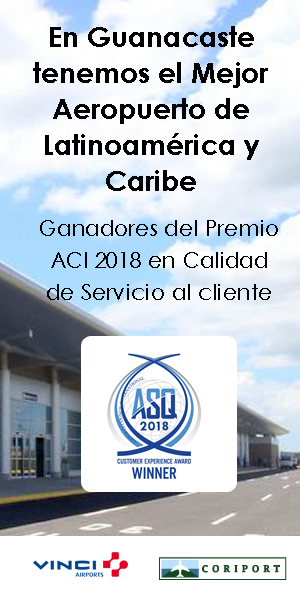 Authorities of the corresponding jurisdictions and respective municipalities will proceed, previously notifying if necessary, with the eviction of the offenders and the destruction or demolition of the construction, remodeling or installations. This newspaper had interviews with the construction department maritime zone department on Tuesday last week in order to ask about the reasons why the law hadn’t been applied. 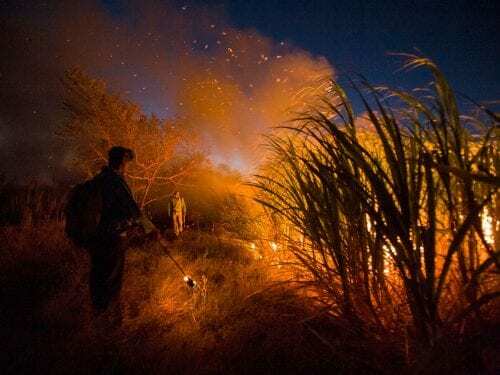 ZMT official Rodrigo Acuña said that the order must be issued by department coordinator Juan Carlos Oviedo, but that he is on vacation until February 21. Construction inspector Josué Ruiz said that he can’t demolish anything until he has permission. 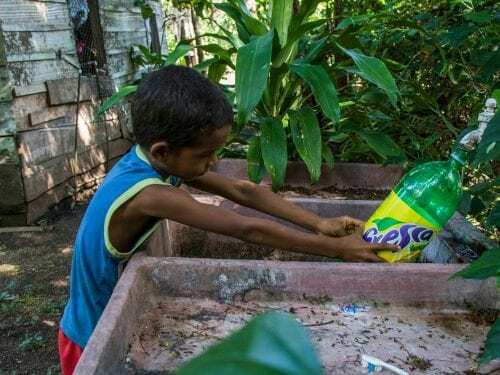 Finally, on Thursday, mayor Adriana Rodriguez said that she would put an end to the problem and issued an order to demolish the ranch. “In the maritime zone department, Juan Carlos isn’t in, but Rodrigo is a paid professional who should be executing things. They manage the ZMT,” Rodríguez said in a phone interview. “I just spoke with Josué [Ruiz] so that we can move along with demolition. 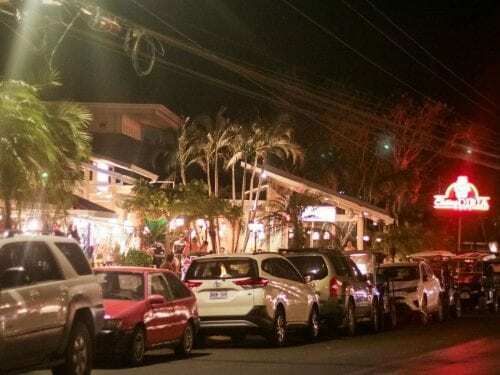 We didn’t have the budget, but he just told me that he is going to hire someone to demolish it because they don’t have a license or construction permits,” the mayor added. Documents show that the owner David Mark Lesman doesn’t have a license for the land or permits from the ZMT department. This newspaper tried to contact Lesman on February 7 but was unable to. The number listed in the files is of a law firm that doesn’t represent him. The property is registered under Dr. David Limitada and a lawyer named Aguilar and David Lesman himself are listed as managers. Another lawyer named Esquivel is listed as a resident. The number for Aguilar’s law firm appears as the point of contact in the documents, but he said that he is unaware of the situation. “I’m not aware of the issue. I’m going to contact Mr. Lesman’s attorney,” he said in an email. On the phone, he added that he doesn’t represent Mr. Lesman and that he will withdraw his name from Lesman’s paperwork due to this situation. Esquivel also said he was unaware of the construction and that he will contact Lesman tomorrow to find out about the situation. He also said that he filed paperwork for Lesman, but that he isn’t his lawyer. 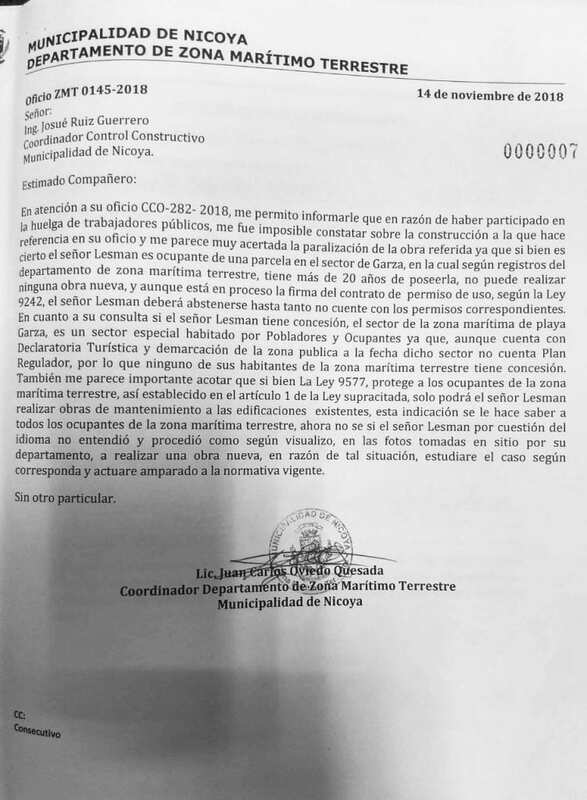 The ZMT department confirmed that no type of construction can be built on Playa Garza because there is no zoning plan and, therefore, the city cannot issue licenses. Meanwhile, the city can give land-use permits, but even with that permit the owner cannot build. Official documents indicate that October 31, 2018 was the first time city engineers halted work and let the ZMT department know about what was happening. ZMT coordinator Juan Carlos Oviedo said on November 14 that he hadn’t studied the case cause he was on strike. The document confirms that Lesman is still in the process of requesting land use permits and states that they will study the case. “Mr. Lesman can only perform maintenance of existing construction, this indication indicates to all the occupants of the maritime zone. I don’t know if Mr. Lesman didn’t understand the language and proceeded,” Oviedo said at the time. The second time the construction department closed down construction was on January 9. 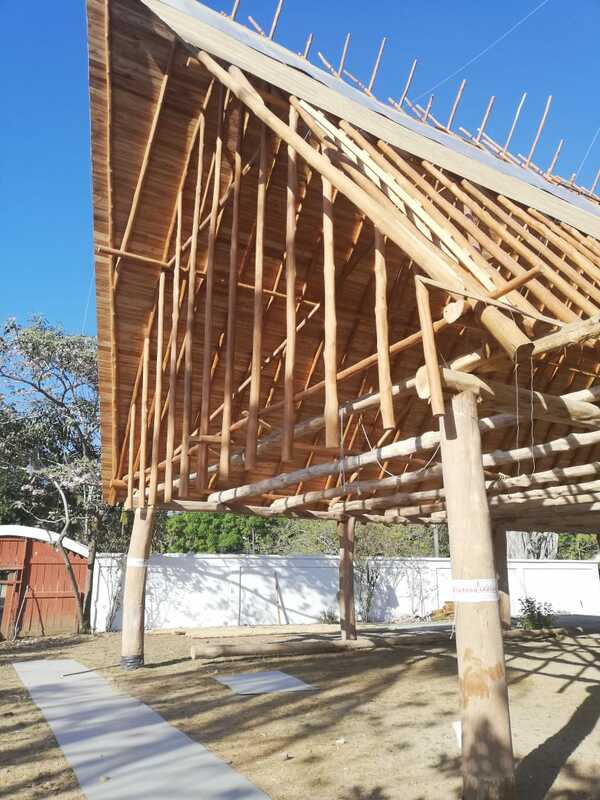 “A site visit was made and we could see construction work continuing, specifically in the preparation of wood for the roof, ignoring this administration’s closure order,” the document says. It is signed by architect Jesus Abadia Vargas, coordinator at the time. 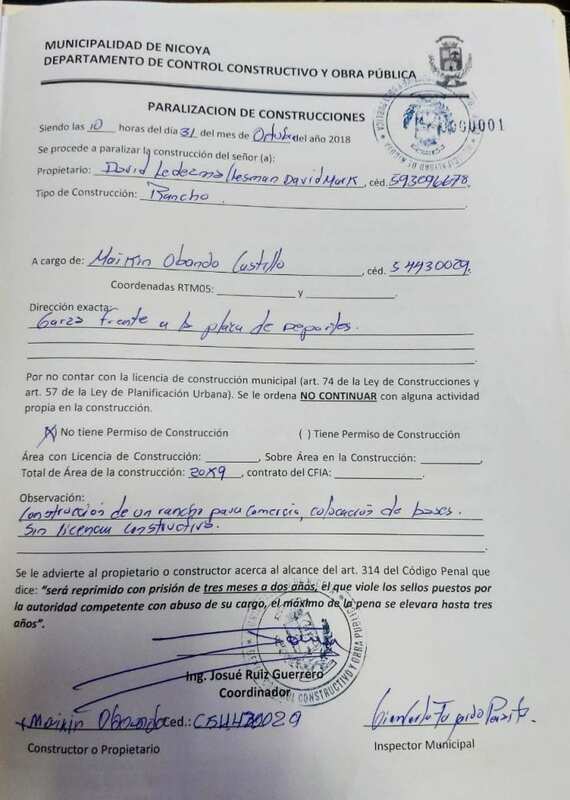 In The document, dated January 17, 2019, Abadia consulted with the ZMT department to see if they could demolish the construction.There is no evidence that Oviedo had answered until today. Meanwhile, construction began again and again without the proper permits and no one in city hall can explain why they continued.